Searching S.B.Jain Institute of Technology Management & Research Assistant Professor Vacancy in December 2018? 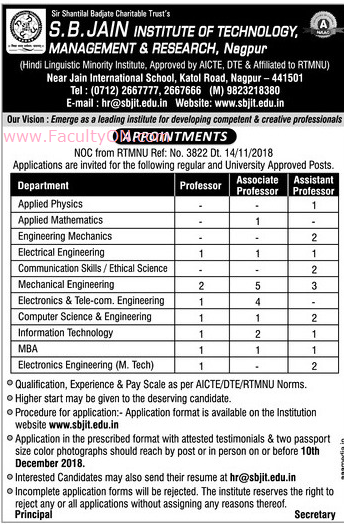 S.B.Jain Institute of Technology Management & Research, Nagpur has advertised for recruitment of Professor / Associate Professor / Assistant Professor jobs vacancies. Interested and eligible job aspirants are requested to apply on or before 10th December 2018. Check out further more details below. How to Apply: Interested and eligible candidates are requested to send application (prescribe form available with college website) along with Resume, attested copies of certificates / testimonials and 02 recent PP size photos to the email address provided here or postal address or apply in person. Note: There is a field in application form like shown below. 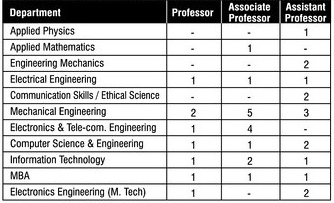 There write in reference (see arrow mark in image) that advt published in www.FacultyON.com . Also put today date, the post you apply and the department for which you apply.